Digi Coat™ Opaque White Coating is used when working with dark coloured substrates or substrates that do not allow any light to pass through them. Digi Coat™ Opaque White Coating is applied before the Digi Coat™ Clear Sublimation Coating to give the substrate a white background on which to transfer the image. Provide a solid white background on which to transfer an image. Maximise the effect of the transfer of the image. Shake the can well for 1 minute. Ensure the surface to be coated is clean, dry, and free from grease. If applying to a polished glossy surface, prime with Digi Coat Adhesion Promoter. Apply in an even motion holding the can approx. 250mm (10″) from surface using light passes over the substrate at room temperature. Allow substrate to air dry for 5 minutes then cure in an oven at 160°C (320°F) for 15-20 minutes. Digi Coat™ Translucent White Coating is used when working with clear substrates such as glass or acrylics, where the image needs to be transferred to the back of the substrate, allowing light to pass through it. Digi Coat™ Translucent White Coating is applied after Digi Coat™ Clear Sublimation Coating is applied. The image transfers through the white coating so when viewed from the correct side the image has a white background. Provide a white background which the image is transferred through. Allow light to pass through the coating to illuminate the image. Prime the surface with adhesion promoter. 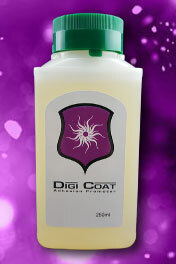 Coat glass first with Digi Coat™ Clear Coating and allow to air dry for 5 minutes. Apply a fine coating of Translucent White over the clear and allow to air dry for 5 minutes. Cure in oven at 160°C (320°F) for 15-20 minutes. Digi Coat™ Clear Sublimation Coating facilitates the image transfer allowing sublimation inks to bond onto the polymer substrate; without Digi Coat™ Clear Sublimation Coating the image will not transfer. Provide a polymer layer which sublimation inks can bond to allow effective image transfer. Apply Digi Coat™ Clear Sublimation Coating smoothly and evenly, holding the can approx. 250mm (10″) from surface using light passes at room temperature, use multiple passes for a higher gloss finish but do not allow the spray to pool on the surface. Allow to air dry for 10 minutes then cure in an oven at 160°C (320°F) for 15-20 minutes. Digi Coat™ UV Protection Coating can be applied at the end of the sublimation process (after the image has been transferred), to add a layer of protection against ultra violet radiation. Exposure to ultra violet light (i.e. Sunlight) can over time cause image fade; Digi Coat UV Protection Coating reduces the effects of UV image fade. Protect transferred images against fading due to prolonged exposure to Ultra Violet light. 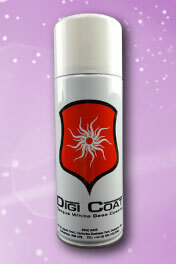 Apply Digi Coat™ UV Protection Coating smoothly and evenly, holding the can approx. 250mm (10″) from surface using light passes at room temperature. Air Dry for 24 hours. The substrate is touch dry in approx. 1 hour, and fully cured in 24 hours. When you are applying your chosen Digi Coat™ product to any hard substrate with a smooth surface such as metal, glass, or acrylics, Digi Coat™ Adhesion Promoter is first required to allow your chosen Digi Coat™ product to bond effectively to the substrate. Ensure all surfaces to be pre-treated are clean, dry, and free from dirt or grease. Apply liberally with a soft clean cloth over the surface to be coated to ensure even coverage. Allow Digi Coat™ Adhesion Promoter to bond with the surface for approximately 30 seconds before removing any excess with clean cloth. When removing the excess, try to eliminate any grease, or smudge marks if any present.